Women in STEM & Cyber Security Programs Coming! Two exciting new programs will be added to the Day of STEM platform in early 2017. The Women in STEM program explores the careers of six industry-leading female mentors in health-care, financial services, information technology and business consulting. 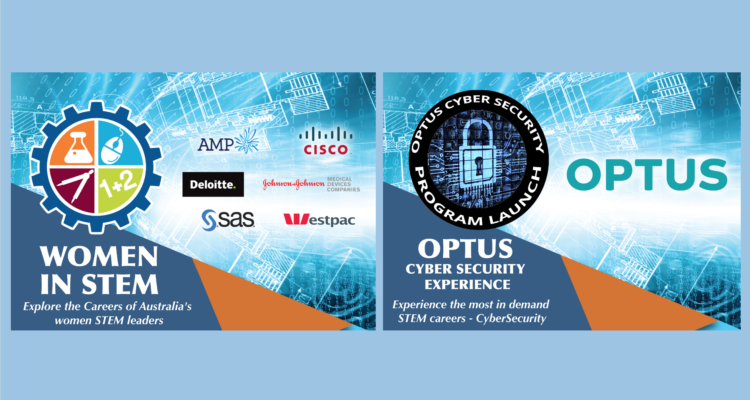 The Optus Cyber Security Experience will take an inside look at the growing field of cyber security through a range of different careers and situations. Teachers, parents and schools will now have four unique Day of STEM programs from which to choose depending on preference, grade level, subject type and interests of the target students. The Women in STEM experience is designed to excite young women and girls considering STEM careers by presenting inspirational female mentors working in STEM roles at AMP, Deloitte, Cisco, Johnson & Johnson, SAS and Westpac. Students will explore each mentor’s journey, build a STEM resume, and participate in an interactive experience that explores multiple areas that each mentor experiences in the workplace. The Optus Cyber Security Experience draws students into an interactive corporate cyber security situation in which key roles and career paths are introduced as the situation unfolds. The program is designed to give students insight to exciting cyber security careers that are in high demand. In addition the experiencing the cyber situation, students will be challenged with a number of exercises and quizzes that introduce them to key concepts and vocabulary used in the field. The new programs are being promoted through Day of STEM’s national education partners and their affiliated state level networks of schools in order to reach student populations across all regions in Australia.